This is fantastic news. Thanks for sharing. I’ve been building my daily to do lists using OpenOffice because I stopped using Outlook a while back. I’ve never been able to completely make the switch to Gmail… I’m one of those infuriating people with a half-dozen accounts, all for completely different purposes–purposes that are crystal clear to me and very confusing if you’re a friend or family member and want to email me. Doesn’t it destroy your productivity if, for some reason, your internet access is down? That’s what makes me the most nervous. This is timely for me because I’ve been revamping my e-mail approach and just opened an Gmail account! Thanks for the heads up on task listing! My ony issue is at the office, I am stuck using the designated office program thats issued by headquarters. I’m going to use the Gmail account for telecommuting purposes when I can’t be logged into the VPN access porthole so this will def. be helpful to organize my tasks. As far as my work account is concerned – I just recently categorized all of my e-mails by task by creating sub-folders in a “current” folder. Within that folder I have folders labeled by project and I am loving the ability to quickly empty my in-box into each designated category. As a project is wrapped up, I archive that projects sub-folder and whala – more space. I love this idea, however my employer will not let us install Firefox. Do you think going from using Gmail/RTM integrated at home to pulling up RTM and Gmail separately at work will just complicate this too much?? 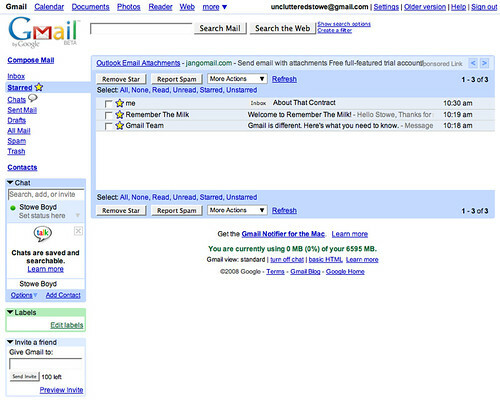 I have not used RTM at all, but I love my Gmail account! This is great. Now I just have to install Firefox. This, and the Google Hacks book I just bought should make my life a breeze. Thank you!!! This will declutter the random index cards I use to replace the awful Outlook Web Access calendar that work expects me to use (remote worker, they don’t provide VPN, and Thunderbird/Lightning is too buggy for me). 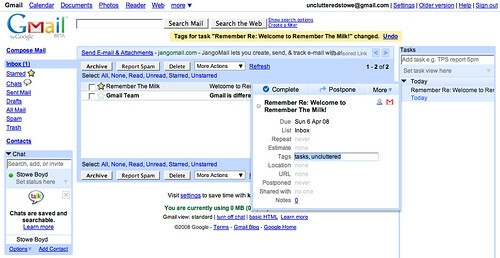 I tried this approach a few weeks back, integrating RTM with my Gmail, and I actually found the integration to be clunky. I didn’t like having to sign in to RTM seperately. I’d like it to be an integrated log-in. Am I missing something there? Ultimately, I ended up uninstalling it as I found it cumbersome. Maybe I should have given it more of a chance. Thank you for sharing! Katie – RTM uses Google Gears (if you have installed that) so that you can run it offline, and then sync. I seldom do that, since I have an EVDO card for my laptop so I am basically always on. Jen – No, I don’t. The RTM unintegrated solution is very well-done (although I have some design quibbles), and the model you suggest would probably feel intuitive. OMGosh. Read it. Did it. I’m loving it!!!! So simple to get up and running. AAAAAAA. Like a kid with a new toy here (and I’m not usually like that). I have Gmail RTM installed on one of my computers, but find extremely annoying that the tab is eating on column. I didn’t find a way to use using stars to turn emails into tasks without having that tab on. Btw, tasks could be emailed to RTM from any email account (I do that from Outlook at work), although it’s less easy. I use RTM iGoogle widget as a primary RTM interface – not only for upcoming tasks, but also for an overview of tasks per project (by using multiple copies of the widget with different settings). sounds great! 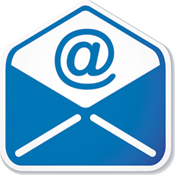 – But how do you create the envelope icon link to the email? Also, what is the meaning/use of all the categories in the pop-out box when you mouse over the tasks? if you cant install firefox, you may consider installing the portable version of firefox on a usb drive. portableapps.com I use foxmarks to sync my bookmarks etc at work, and its great. Thanks for the RTM tip, ive been sending emails to myself when i want to remember things…is there a way to archive the RTM notes? Is RTM searchable..so i can say…yeah i did that one thing…3 months ago. When I check my online sales flyers, I write down what’s on sale in the notepad, then transfer it to my Palm pilot’s grocery list. I have my upcoming appointments listed in the sidebar, in case I didn’t have Google Calendar open already and need to book something in a hurry (or if my ISP is a bit fussy). I have a few important to-do’s listed. I second the PortableApps suggestion; they’re all I use for Firefox, Thunderbird, and several other programs. One of the things I really love about Remember the Milk is that it works with Jott (http://jott.com) and has a nice mobile version I can access from my mobile phone. I like that I can submit new items via email, text message, or voice dictation. I also like that I can build custom filters and have RTM send me txt msgs when items are due. Combine Jott, RTM and Google Calendar and it’s like a virtual personal assistant! I’ve been working with the same idea for the last couple of weeks and have have also added GTDInbox (adds some really neat features to Gmail in a GTD framework) and Better Gmail 2. That may be moving away from the original idea of “a simple way to simplify e-mail”, but all these add-ons seem to play nicely together and really improve the overall functionality of Gmail! And I like Jott too! I’ve started using a combination of my calendar and documents (spreadsheet) to manage my to-do tasks. Perhaps this is a bit much for some people, but with two businesses I find a standard to-do list inadequate. The upside of this is that I have Google Sync (and other google apps) installed on my BlackBerry. This allows me to sync the two; my BlackBerry calendar automatically syncs to Google Calendar every time I add, delete, or modify an item and vice versa. I can access my documents on my phone as well. I can also choose to share any or all of this info with others. I use the calendar like my “assistant” who makes sure certain things get done at certain times. That way I can set a reminder to write a check on Friday at 2 while I’ll also be taking care of another similar item in a similar place. And I can snooze or even reschedule the reminder when it appears on my BlackBerry if for some reason my schedule isn’t working out quite the way I hoped. I just started using Google calendar synced with my BlackBerry two weeks ago; it has been a retraining process learning to not put things into iCal but I’m much more organized and on top of things this way. The one crucial thing that’s missing is a Gmail API. I use a few different machines throughout the day, and the barrier is still too high if a browser extension is required. Perhaps RTM would be a great gobble for the Google Borg? What is the most efficient way to deal with a large number of old e-mails? For a lot of time, I dumped e-mails into backup archives without separating essentials from the rest. At this point, I got around 400000 e-mails starting with 1999, in the form of thirty backups in three different database formats. I do not want the archive to grow this much anymore, hence the need to declutter this area. So, here is what I have done so far. 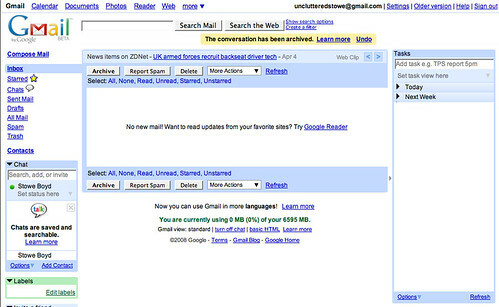 First, I used the original e-mail programs to export e-mails to a common format. As the second step, I loaded the exported mails into Thunderbird. Third, I used the Remove Duplicate Messages addon to remove all duplicates (this addon can remove duplicates even if they are in different folders!). Now I got around 40000 of them in 200 folders, and I want to choose the essential ones and throw the rest. At this point, I need to deal with them manually. Could the blog readers, who went through something similar, share their strategies on dealing with massive amounts of old e-mails? I know why there is no task list in GMail: They have an outstanding calendar. Why then need a task list if you have a calendar? 1. Get it done sometimes: Schedule it on the calendar. 2. Not so important to waste time: Archive it (and maybe tag it with “maybe later”. My experience: If you don’t schedule it, it will not get done. Getting things done means that you need to find a time WHEN to get these things done. I don’t use to-do-lists any more. Only thing I have is those two labels “Action” and “Waiting” (for somebody else to response or take action). The action label is for temporary use only as long as I have not decided about the optimum day/time when to schedule. HELP…. how does this work? i’ve been using the add-in for some time but have never heard of this. how do you make this automatic? I’ve been using RTM within the GoogleCalendar for a while and it works fine for me; however, the RTM-Gmail integration is definitely interesting. I use GTD Inbox with Gmail and I wonder if GTD and the RTM add-on play nicely together? I seem to get logged off from RTM every time I star a mail.. Something not quite right, I guess! Any comments appreciated. what a great article. I have tried and found that RTM is a great way to keep my inbox at zero and organize my information. No more searching through archived emails. Very GTD! Thanks for the great article. This is just what I was looking for … and it combines the 2 things I use the most for email and browsing : Firefox and Gmail.